With Obstructive Sleep Apnea, muscles of the soft palate at the base of the tongue and the uvula (the small conical, fleshy tissue hanging from the palate) relax and sag, obstructing the airway, making breathing laboured and noisy snorting). Collapse of the airway walls blocks breathing entirely. 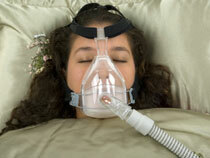 When breathing periodically stops, a listener hears the snoring broken by pauses. As pressure to breath builds muscles of the diaphragm work harder. Sleep is then temporarily interrupted, sometimes only for seconds. This, in turn, activates throat muscles and “uncorks” the airway. The effort is akin to slurping a drink through a straw that is stuck in a lump of ice cream. A listener hears deep gasping as breathing starts. With each gasp, the sleeper awakens, but so briefly and incompletely that he or she does not remember doing so in the morning. 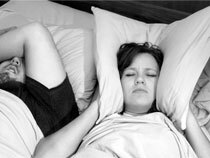 Someone with obstructive sleep apnea may stop breathing for ten seconds or more…dozens, even hundreds of times each night, thus resulting in daytime sleepiness.